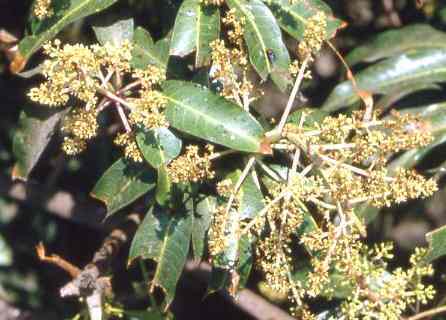 Unripe fruit, al­ways dried and most­ly ground. Sour and astringent, with a slight, resinous overtone. Citric acid and related compounds are responsible for the sour taste. Several terpenes (ocimene, myrcene, limonene), aldehydes and esters have been found in the dried unripe fruits. 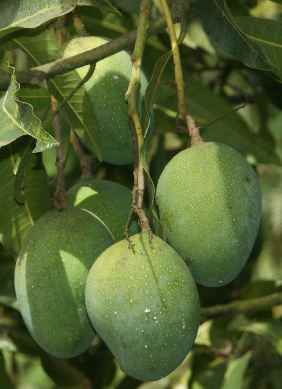 Further­more, unripe mangoes contain proteolytic enzymes. In ripe mangoes, volatile compounds (40 to 70 ppm) are ocimene, limonene, α-terpineol, 3-carene, β-selinene and myrcene. 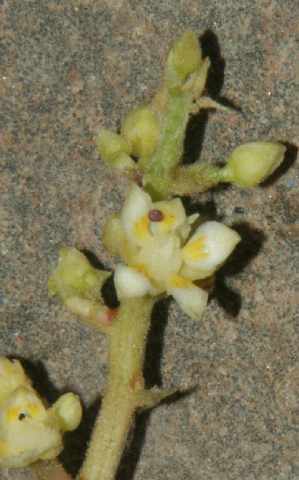 The yellow colour is due to about 30 ppm β-carotene. South and South­east Asia. 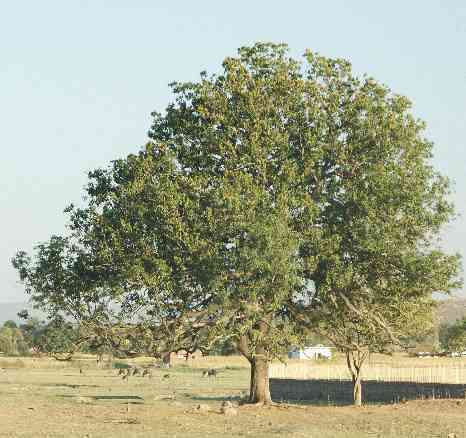 Wild mango trees are known only from North-East India and Burma, and so it appears plaus­ible that the species evolved there. The name mango, almost identical in countless languages, is derived from Tamil, the most important language of Southern India, and was transferred to the West by the Portuguese. 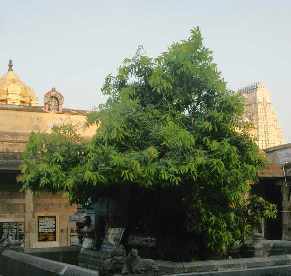 The general term for mango in Tamil is mamaran [மாமரம்], but the fruit is usually referred to either as manpalam (also transcribed mambazham [மாம்பழம்]) ripe mango fruit or mangai [மாங்காய்] unripe mango fruit . It appears that the latter term was picked up by Portuguese sailors who encountered the fruits at harbours and markets; perhaps, mangoes were dominantly traded in the unripe state at that time. 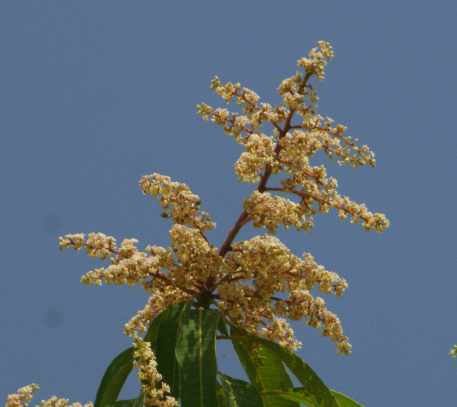 The North Indian names for mango derive from Sanskrit amra [आम्र], itself probably a Dravidian loan and thus related to the Tamil words noted in the previous paragraph, and even to English mango. Only Hindi amchur (also transcribed aamchoor) [आम्चूर] refers to the dried spice, whereas Hindi am [आम] means the fresh fruits. Sanskrit names like madhulaka [मधूलक] refer to the sweet taste (madhu [मधु] sweet ). See licorice and bear’s garlic for related words. 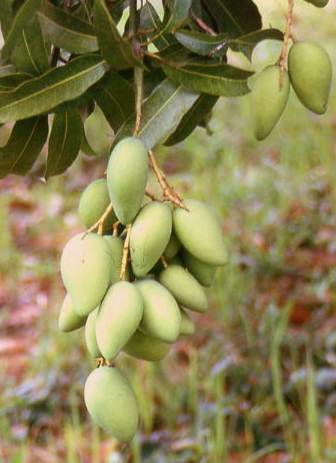 The genus name Mangifera ( bringer of mango ) contains Latin ferre carry, bring (see also asafetida), cf. Lucifer bringer of light or Christopher he who carries Christ . Mango is one of the most popular tropic fruits and enjoyed by everyone who ever had the opportunity to eat a fresh, ripe mango in the production countries. Mangoes available outside the tropics, however, vary much in their quality, depending on the state of ripeness at plucking time. Nevertheless, ripe mangoes are often used for desserts in Western cuisine, and make an excellent ice cream (see vanilla). 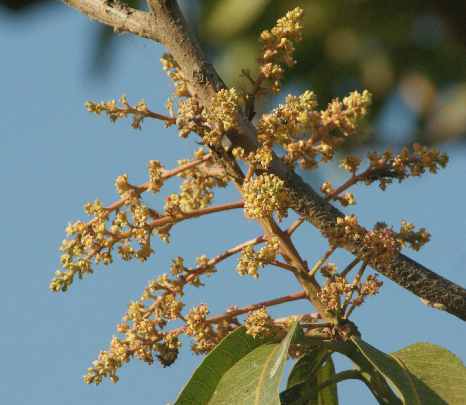 It is, though, surprising and not much known that the unripe fruit gives a remarkable spice much used in Northern India (but, to my knowledge, nowhere else). The stone removed, the fruit is cut in slices, dried and afterwards ground to a pale gray powder. This powder is used frequently instead of tamarind, the other important sour element in Indian cuisine; mango powder is, however, much weaker than tamarind and has a subtle, resin-like taste. 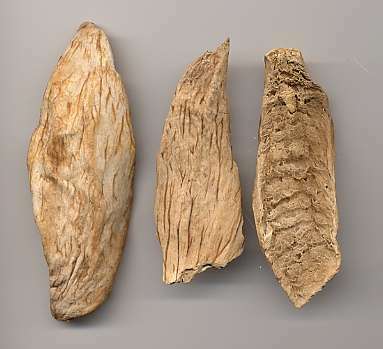 It is mainly used when only a hint of tartness is desired or when the dark brown colour of tamarind is to be avoided. Mango powder is generally more popular with vegetables than with meat, but is frequently found in tikka [टिक्का] spice mixtures for barbecued meat. To prepare the famous barbecued meat of Northern Indian cuisine, an Indian clay oven (tandoor [तन्दूर]) is required, but substitution by a Western baking oven is acceptable. Meat to be grilled is seasoned with a mixture of several spices (cumin, coriander, fresh ginger and garlic and mango powder, but little or no chiles) with red food colouring and plain yoghurt. After some hours, it is quickly roasted in the very hot tandoor. Mango powder here serves not only as a tart and sour spice, but also as a meat tenderizer. Pickled un­ripe mangoes are a common Indian condi­ment (aam ka achar [आम का अचार]) that is served all over North India, par­ticu­larly to­gether with simple meals of rice and cooked legumes (dal [दाल]). The best varieties are prepared using pungent Bengali mustard oil. Its South Indian sibling, avakaya [ఆవకాయ] from Andhra Pradesh, is dark red due to excessive amounts of chile, and derives additional pungency from untoasted, ground mustard seeds. In Karnataka, a similar pickle is called mavina uppinakayi [ಮಾವಿನ ಉಪ್ಪಿನಕಾಯಿ]. A pickle similar to aam achar but made from ripe mangoes and much less oily (amba [عمبه]), is eaten in Iraq, where it is also processed into a coarse sauce that goes well with grilled meats (shawarma [شاورما]). Due to Iraqi Jew immigrants, this has also become quite popular in Israel (ambah [עמבה]) for chickpea balls falafel [פלאפל] and broiled meat shawarmah [שווארמה]. 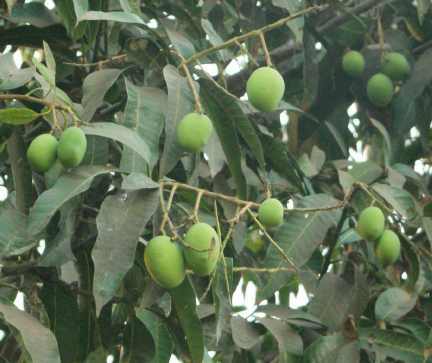 Ripe mangos are a popular fruit and may be used for stewed fruits, fruit jam, fruit cakes and many other standard fruit appli­cations; they can, however, even used for savoury dishes. Indonesian fruit salad (rujak) combines fresh fruits (not too ripe mango, pineapple, papaya, in Jawa frequently cucumber) with a pungent sauce of palm sugar (won from coconut or other palm trees), fresh red chiles and salt; on Bali, a hint of shrimp paste (trassi, see also Indonesian bay-leaf on Balinese cookery) is never omitted. The result tastes even more delicious that the recipe looks strange! Mexicans sometimes use ripe mangoes or other tropical fruits for their fiery salsas (see long coriander). Even if it is hard to believe, the extremely hot habanero chile goes very well with fruit aroma. Several other plants are used to give a sour (tart or fresh) taste to the food; it is convenient to distinguish between fruity, sweet–sour plants on one hand and purely sour spices on the other hand. In the first class, besides ripe mangoes orange and pomegranates and other ripe fruit must be mentioned. Greater importance, however, must be attributed to the representatives of the second class. 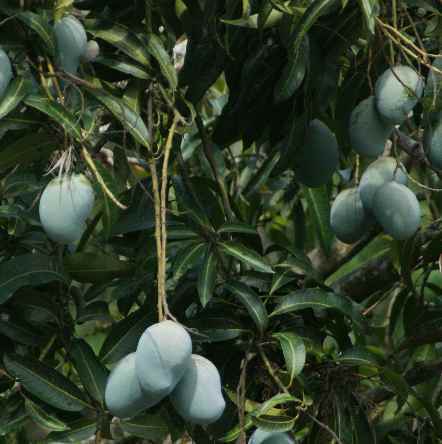 Despite their blueish hue, these mangos are ripe! Among these, lemon is probably the most important and extensively used in Latin America and the Eastern Medi­terranean region (where also sumac is common). In the tropics, lemon is outweighted by a close relative, lime, which has a most refreshing acidic flavour. Lime is indispensable in the cuisines of tropical America (parts of México and the Caribbean) and Asia (Thailand, Indonesia, Philippines, India); in contrast, kaffir lime is important as a source of citrus-like aroma, but not acidic flavour. Another essential sour ingredient throughout the tropics and subtropics is tamarind; its acidity is well balanced (neither pungent nor astringent) and is particularly suited for spicy or even fiery food. When speaking about sour food additives, vinegar (though not a spice) should not be forgotten; made from various alcoholic sources (palm wine, rice wine, brandy, fruit wines, mostly from grapes or apples; industrially the most common source is wood), it is known and held in favour all over the world. Depending on source material, manufacturing process and storage, vinegar may be monodimensionally acidic (as white South East Asian rice vinegar or the industrial vinegar sold in Western countries), or mild (as with coconut vinegar), or it may develop a complex, rich and wonderful taste like the famous and rightfully high priced aceto balsamico (balm vinegar) from the Italian town Modena, which is aged for years in open barrels of fragrant wood. See dill on the topic of herb-flavoured vinegar.